LONG BEACH, CA (Laserfiche)—November 2, 2009—Laserfiche has selected Infolinx System Solutions as a valued member of its Professional Developer Partnership™ (PDP) Program. Infolinx will provide an integrated enterprise records management solution that also encompasses physical records. The integrated offering manages the full life-cycle of corporate records, regardless of media type, while streamlining the processes for managing documents and workflow. Scheduled for release in the first quarter of 2010, the solution promises the full featured ECM capabilities of the Laserfiche suite of products, along with the industry leading physical records management features of Infolinx, including barcode and RFID tracking, space management, inventory reconciliation and online requesting and transferring of records. Having provided records management consultation and software services since 1987, Infolinx has extensive experience partnering with various solutions providers to implement strategic and scalable records management applications. Infolinx System Solutions is a leading provider of enterprise physical records management software, professional business services and information management consulting products to a broad range of commercial and government clients worldwide. Infolinx solutions and services manage critical business documents from point of creation through final disposition, offering customers reduced risk and improved operational efficiencies with a verifiable return on investment. Infolinx maintains clients within all major business segments and the public sector. Visit the Infolinx website for additional information. 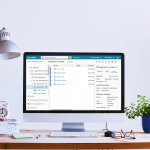 Laserfiche®creates simple and elegant enterprise content management (ECM) solutions that help organizations run smarter. Since 1987, more than 27,000 organizations worldwide—including federal, state, and local government agencies and Fortune 1000 companies—have used Laserfiche software to streamline document, records and business process management. Laserfiche fosters active collaboration among clients, resellers and third-party software developers through our Professional Developer Partnership™ program. On the Laserfiche Marketplace, you’ll find detailed descriptions of the integrations, configurations, plug-ins and Web tools created by our PDP members.